The NY Daily News' Michael Goodwin says Obama is in trouble. The candidate's recent underwhelming poll numbers could be a result of Obama mania backlash, a result of him falling short of impossible-to-meet expectations. "If I were running the Obama campaign, I'd be terrified," Goodwin writes. David Freddoso writes in The Wall Street Journal that Obama is just as slimy as the next power-hungry pol. Obama won his state senate seat by disqualifying his four opponents using old-style Chicago politics: "Mr. Obama is not the reformer he now claims to be," Freddoso writes. The NYT's Maureen Dowd wonders what it would be like if Hillary and McCain conspired against Obama. Ah, the possibilities. But would they really conspire over a chilled bottle Stoli? " 'Our toast to The One,' they say in unison, 'is that he's toast,'" she writes. Obama gets the P1 treatment from the Times today. The Democratic candidate -- who has said negativity will not be a part of his campaign -- has gone negative. 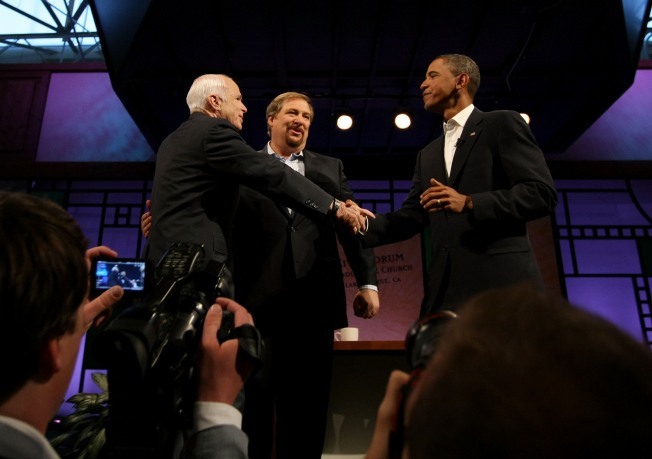 Obama is starting an advertising campaign that will portray McCain in poor light: as out of touch with the middle class.